Read what our most recent customers have to say about our products! Great item and extremely fast shipping! Would recommend! I love it. Short and sweet. I have now bought two, and will likely soon get a third. I have one in my office for all clients to use when they arrive. It fives them a nice boost of energy for appointments, even after a long day of work. I've even used it for a rescued crested gecko with Failure to Thrive. (Yes, you read that correctly.) She'd gone 4 months without gaining anything, but with a few minutes of light a week she's gained 33% of her body weight! Simply terrific. Great product and responsive customer service when I had a question about installing the product (it turns out that the answer was simple, the light bulb had simply gotten jostled in transit but it still worked great once readjusted). I am thinking of getting a second... happy with the results so far! Quick Shipping and I'm VERY satisfied with my purchase! This product provides me with the vitamin D i need that I can't get from my diet due to IBS. 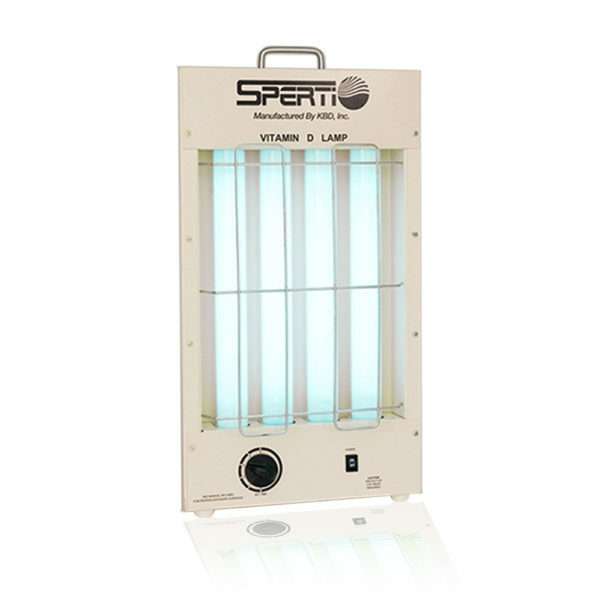 I recommend the Sperti Sunlamp to anyone with MS living in the North as a supplement. The Vitamin D box arrived quickly. I wasn't sure if I had entered my shipping address correctly so I emailed the office. I got a quick reply and the box was delivered to the correct address. Very pleased with the purchase. The Vitamin D lamp is very solid, obviously well made and of the highest quality. I'm confident it will serve me a long time. I stopped taking vitamin d to see if this light really helps - it did! By the way: i do 4x 5 minutes (2 upper and lower front, 2 upper and lower back). Good luck with it! This high quality sunlamp works and was packaged very well. I recently bought another tanning product from another company that was poorly packaged and one of the bulbs broke. I highly recommend the Sperti products. Love the product. Had to purchase an extra bulb when I broke one. Great service...... The girl in the office emailed me with clear instructions on how to get the lamp to work after it was transported to Australia and her follow up emails were great. Would purchase again from this company. Great service. Prompt delivery. Love the Fiji sunlamp. Sturdy construction and easy to use. I have MS. I need Vitamin D exposure every day just to function. I bought a Fiji Sun Lamp. The delivery service delivered it to the wrong everything! I could track and see the error in real time. I called Sperti and Beth made sure I had a unit the very next morning! … without hesitation! I could not appreciate their efforts more. Within 24 hours I had my first session and could walk much better thanks to this awesome lamp and these wonderful people. Thank You for your Humanity, … It does make a difference. I will never forget. The machine itself is all metal and really well made. I can't imagine better people to do business with! This is my 2nd psoriasis lamp from Sperti. Each has performed perfectly. The newest one is more powerful so treatments take less time. Very satisfied. Excellent, solid, high-quality product that I use near daily. Wouldn't be without it! I had a very good experience in dealing with Sperti. The products are first rate and the service was excellent. I received my lamps quickly as promised and they are very good quality items. The sunlamp was exactly as advertised. we are pleased with the purchase. Sperti Sunlamp down under: Purchased UVB lamp few months back to boost my Vitamin D levels. The online purchase was smooth and the support I received is excellent so far. Since I purchased the product with out actually seeing it - I was a bit apprehensive at first. However, quick response from the support team and the way they shipped the device with correct, high quality 230volt power cord was truly impressive. Most importantly, nothing was damaged during it's long journey to the other side of the world. First time purchasing this lamp , you will love it after few times when you get tanned. This machine can help you get tanned anytime , any place. Easy and simple to operate , all delivery are great and protected. Hints : first time operate this machine when you received it , you need to switch on and off 10-15 times to new start the new bulbs. After few times , it will become 1 click start. Great product! I never used any tanning device prior to the Sperti and was skeptical as to the results. Let me tell you it does work and works well. Use it as directed unlike myself who went closer to the lamp the first time and way longer than suggested time and I got an extreme sunburn. Have been using it ever since and love it to help my rosacea be almost unnoticeable. Firstly, I was surprised on how quickly my lamp order was shipped and received seeing I was an out of country (Canada) customer. The product functions as advertised, without any problems. We have been using the lamp for about 6 years (winters only), and haven't had the need to order replacement bulbs. Has our vitamin D levels risen as a result of the lamp? I really can't answer that truthfully. I have no way of checking. I have put my total faith in Sperti to produce a product that does what it says it will do. Great. Love the product, works as described. Yes, you do need to heed the warnings and don't rush. Increase by a minute or so if you have no redness. Great shipping. I was really impressed with the packaging, thank you. The first night I did my face and neck for 4 min. I really didn't see much, so next night I did my hips, stomach, chest and shoulders for 8 min. Omg. I have been tanning since 1985 and don't remember a burn like that, now it is a pretty tan. Moral of this story follow the instructions and start slow because this is a serious machine. I am so glad to find a quality product made in the USA. THANK YOU! When I moved from California up to Washington the change in sunshine was obvious to my body. I'm a health and fitness fanatic and I knew I needed to supplement my vitamin D due to this move. I avoid processed foods and artificial stuff, I want natural and healthy! My research on the web eventually led me to your UVB sunlamp product and I am very happy I found you. Your Vitamin D Lamp is now an essential tool in my health & fitness routine. Thank you!! I love the summer sun, and if I had a winter social event I would usually visit a tanning salon to get a little color for looks. A friend introduced me to your Fiji tanning sunlamp, I borrowed it once and then I bought my own! In the winter I just want a little color and to keep my skin looking smooth and healthy. Here is my positive review you can post for your Fiji: "A quality product, my Fiji Sun lamp is both convenient and effective, and it leaves me looking good and feeling healthy!" Thanks again Sperti! I had your old model Del Sol tanning lamp for about 9 years and I upgraded to the newer Fiji Sun. I like the bigger size and better coverage, good upgrade Sperti! The best thing for me is the convenience of being able to tan at home whenever I feel like taking a little sunshine break. I'm busy, but in less than a minute I can plug in my Fiji Sun and feel sunshine on my face. I always feel much better after a relaxing sunlamp session so I decided to write & send you this nice review as my way of saying "Thank you". Here's the online review for my new Vitamin D Lamp. Thanks again. -- I was confident it would work because I did my homework. Sunshine, uv rays, and Vitamin D, simple science. I prefer to get my Vitamin D naturally from the sun, and now I can also get it from your Vitamin D Lamp when I can't get outside. Even though I was feeling great, I did indeed go back and have my Vitamin D levels tested again and I am back in the healthy zone. Tim in PA.
My very own portable sunlamp tanner! 10 out 10! I am perfectly satisfied with my new Fiji Tanning Lamp, thank you! I bought one of those tiny white plastic ones online for about $120 and it was a total piece of cra#. I was inspired to write you a positive review for your Fiji Tanner so others will not make the same $120 mistake I made on that plastic Chinese unit. My localized psorisis + your UV lamp = success. Each fall my psoriasis comes back and I begin my routine of going to a tanning bed once a week to keep it under control. I bought the PH-36f for my localized psoriasis and it is working well. Visiting a tanning bed did help my psoriasis clear up but I really wasn't interested much in getting a full body tan to treat my patches of psoriasis. Only those of us with psoriasis understand how embarrassing it can be at times. This device works for me and I am grateful! Your Vitamin D Lamp is the real deal. I did all my research and even read much of Dr. Holick's Vitamin D research. One of my best purchases I've made for my health. Best Regards to you all. At age 40, after working indoors for 25 years, I accidentally discovered at a health fair that I was vitamin D deficient to the point that I had osteoporosis. I have a petite athletic build, exercise, calcium is fine. 50,000 toxic units of vitamin D didn't return my levels to normal, but this lamp did! I've had it for over a year. No household should be without one (unless you live on the equator) - it is well worth the $. Vitamin D levels are now normal the natural way since I've had it. I've never been into tanning - this lamp doesn't do that. I have a doctorate degree in science & find the medical research on this lamp impressive & compelling. I don't feel like this lamp will be a significant factor for skin cancer or wrinkles, assuming it is used as directed. This lamp is very sturdy - my large clumsy dogs have knocked it over several times and it works perfectly. I plan to build a nook in my new house especially for it, since I will be using it for the rest of my healthier life. I'm writing this review for you because I wasted years and so much money on creams and also driving to UV light therapy sessions, and want to share my story. Then I bought the PH-36F psoriasis lamp and it works just great for me. No more creams and expensive office trips and its already paid for itself. Thank you all much.